Kids will sleep tight in the Vagon bunk bed, made using safe materials even for the youngest. Designed by Spanish brand Lagrama, the Vagon bunk bed is a perfect solution for small bedrooms if you don't want to give up on style or elegance. This bed boasts a very simple and streamlined, yet extremely sophisticated design that is manicured down to the smallest details. Beside its 2 bunk beds, this furnishing item is complete with a third pull-out bed that is hidden by fake drawers - a handy solution for a sleepover or a slumber party, without the need to taking up extra space. This bunk bed is suitable for children of all ages. A safe side on the upper bed prevents even the youngest ones from accidentally falling down. A nift metal ladder takes up no room at all and is safely attached to the bed frame. It makes the climb up easy even for small children. This bed is 200 cm long, 100 cm deep and 162 cm tall. Mattresses are not included. Recommended mattress size is 90x190 cm. 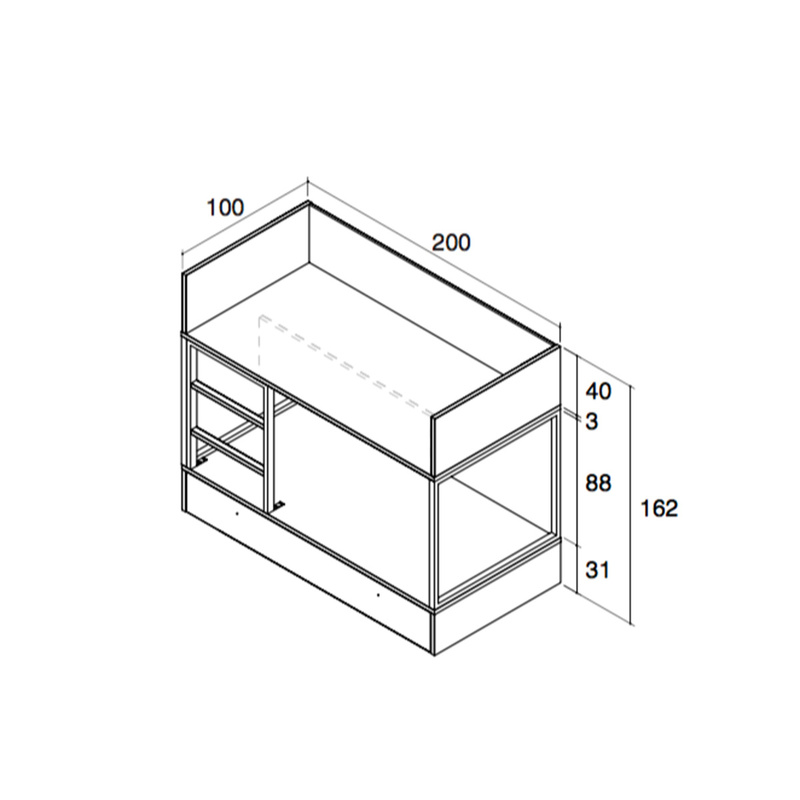 The distance between the upper and the lower bed is 88 cm. The size of the whole structure was designed in order to guarantee two spacious and comfortable beds, while keeping the outer shell at a minimum in order not to take up space in the bedroom. 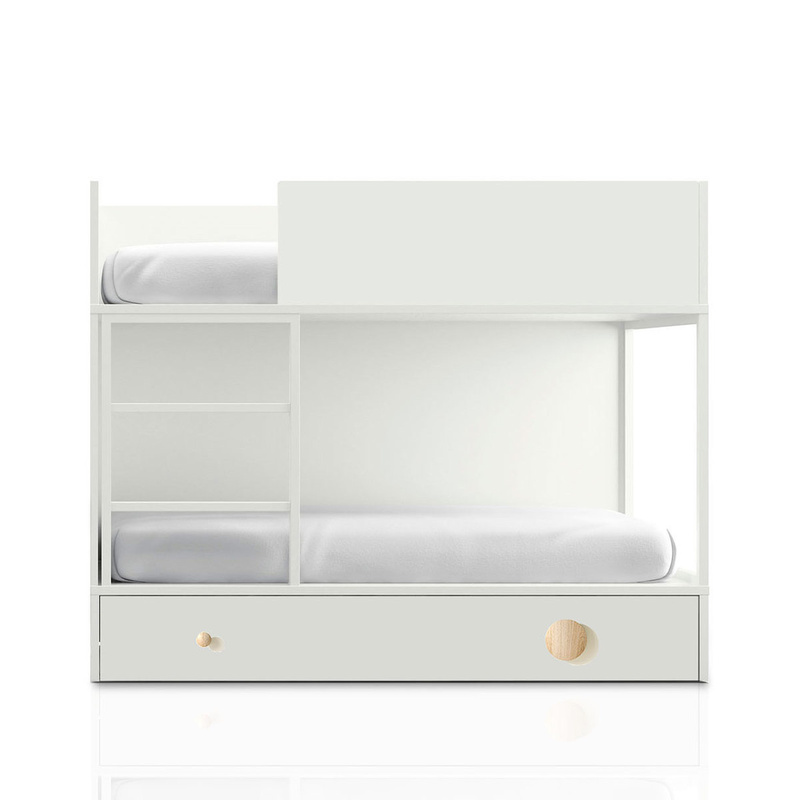 The Vagon bunk bed is made from matte white laminate, while handles are made from robust solid oak wood in a natural colour and are easy to pull out. The whole structure was made using recycled wooden boards, worked at high temperatures with melamine resins. This material is certified as E1, meaning that it has low formaldheyde emissions and is therefore safe for children's use. Water lacquering is applied directly to each panel, without the need for solvents. This range of bunk beds is perfect to ensure safe and sound sleeps to kids and parents alike. Panels are made of 3 layers. The outer 2 are made from a sturdier material that is highly resistant. Lagrama is a manufacturer of kids' furnishings established in Spain in 1982. The company's production is carried out according to a constant research meant to find the maximum comfort for children in their living spaces. Lagrama offers a functional, innovative, cheerful, high quality production. Lagrama is certified by Aidima (Instituto Tecnologico del Mueble in Spain).